The City of Boulder has actively protected Boulder Creek within its city limits since the mid 1980’s. More recently, the City has implemented the Greenways Master Plan to protect the riparian habitat of the outer reaches of the river – outside of the city. By protecting the creek’s tributaries, the plan aims to safeguard the ecosystem benefits of the stream corridors, including filtering rainwater, mitigating floods, facilitating stormwater drainage, and providing habitat for a diversity of flora and fauna. Additionally, the plan creates opportunities along the stream corridors for recreational use and bicycle and pedestrian transportation routes. Boulder Cityscape. Photo via Wikimedia Commons. After a flood in 1969 that caused $5 million in damages, the City of Boulder undertook their first major effort in flood control. Flood mitigation techniques that channeled water through concrete structures were popular at that time. However, as a city committed to improving the quality of life and the urban environment, the use of concrete structures to channel stream flow evoked considerable public opposition. Strong public sentiment during the 1980’s afforded the city the opportunity to provide “a unique opportunity for creating a comprehensive Greenways system for the community” that could be “creatively developed to function as storm drainage and flood channels, efficient bicycle and pedestrian transportation systems, open space and wildlife corridors and attractive recreation areas” (Tributary Greenways Master Plan). The Greenways Plan built upon efforts to reconsider typical, hardened flood controls after the 1969 flood. In 1984, the City Council adopted the Boulder Creek Corridor Project, which laid the groundwork for the Greenways Master Plan. In 1989, City Council adopted the first Greenways Master Plan, which included Boulder Creek and six of its tributaries. The 2011 Plan incorporates the remaining main tributaries bringing the total to fourteen. The Plan’s objectives include: protecting and restoring riparian, floodplain, and wetland habitat; enhancing water quality; mitigating storm drainage and floods; providing alternative modes of transportation, namely routes or trails for pedestrians and bicyclists; providing recreational opportunities; and protecting cultural resources. The development of the Greenways Master Plan began with an inventory of each tributary to assess its geographical description, type of environment, existing trails and cultural and historic resources, as well as its availability for flood mitigation and aquatic habitat. After the inventory was completed, sites for trails and facilities were identified along the river’s tributaries. Through the Plan, undeveloped areas along the tributaries are linked to provide a network of stream corridors for human use and ecological benefit. The Greenways Master Plan provides the framework needed for the implementation of its objectives, including: planning, construction, funding sources, and maintenance. Existing policies and plans affect implementation of the Greenways Plan. The projects within the Greenways Plan are spoken for in various other plans as well, creating redundancy to ensure these projects are implemented and maintained. The Greenways Master Plan works most closely in connection and coordination with the City of Boulder’s Comprehensive Flood and Stormwater Master Plan. Other plans with overlapping goals and programming regarding greenways include: the Boulder Valley Comprehensive Plan, the Comprehensive Flood and Stormwater Utility Master Plan, the Transportation Master Plan, Parks and Recreation Master Plan, the Water Quality Strategic Plan, sub community plans and stream specific flood mitigation plans (Greenways Master Plan). Funding for the Greenways Program stems from different sources including the State’s Lottery Fund, the Stormwater and Flood Management Utility Fund, and the Transportation Fund, for a total of $450,000 per year. In addition, Boulder has a long-standing commitment to, and strategy for, funding quality open space. Since 1967, the city has used a 0.88% sales tax to purchase, manage, and maintain open space. The Open Space and Mountain Parks department manages this fund. The Greenways Program is a major component of this department. The next phase of the program, including funding and projects, planned for the 2013-2018 time period, is underway. Boulder Creek has many tributaries within the city of Boulder and in the surrounding area. Flooding in 1969 caused extensive damage and motivated the community to reconsider hardened flood controls and to protect the stream corridors. The City of Boulder adopted a revised Stream, Wetland, and Water Body Protection Ordinance in 2009. This ordinance discourages development activities in wetlands and areas adjacent to wetlands. Any proposed project within the Greenways must receive a wetlands permit by demonstrating that the project has been designed to minimize adverse impacts to a wetland and its functions. Greenways projects are subjected to a federal wetlands permitting process as well. Under section 404 of the Clean Water Act (33U.S.C. 1344), the US Army Corps of Engineers is authorized to grant permits to projects which modify drainage channels or otherwise affect streamside vegetation. Projects must demonstrate that they will not discharge dredged or fill material into the waters of the United States. The City has developed zoning and land use programs to assist the city in dealing with flooding more effectively. Under Title 11- Chapter 5 of the Boulder Revised Code, developed land must ensure adequate drainage and management of storm waters and floods falling on or flowing onto the property. Under Tile 9- Chapter 9, a Floodplain Development Permit is required for all development in the floodplain. 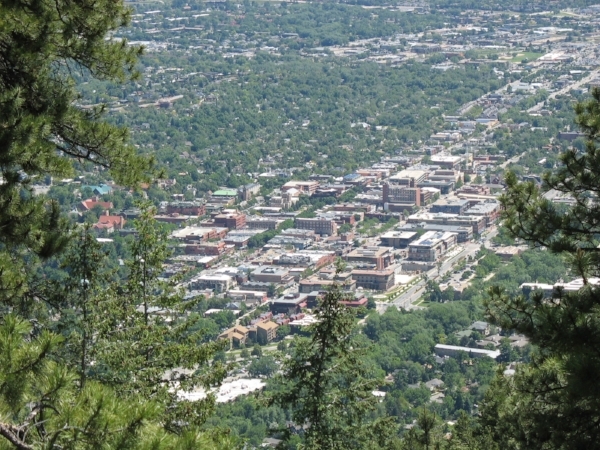 The community of Boulder highly values its natural environment and has advocated for more effective means of flood mitigation since the 1970s. This initial advocacy laid the groundwork for the development and continued improvement of Boulder’s Greenways. The greenways provide citizens alternative transportation routes and a public space for recreation. Paved paths, unpaved trails, and fishing ponds are created for the community’s use. The greenways are often crowded, showing their popularity among users. Greenways offer alternatives to vehicular transportation for the area’s residents. Additionally, green infrastructure, such as greenways, provides services such as filtration of rain water, flood mitigation, and stormwater drainage that are otherwise provided by large, expensive public works projects. Paved pathways along the stream corridors offer pedestrians and bicyclists alternatives to roads for transportation. Additionally, unpaved trails were created for walking, hiking, and bicycling. The establishment of the Greenways Program falls within the category of green infrastructure. Protecting the city’s natural areas provides infrastructural services such as rainwater filtration, flood mitigation, and stormwater drainage for the city. The City of Boulder values its open spaces and has proactively taken action to implement a program that increases accessibility to these spaces, while also designing them in a way that offers flood protection and restores riparian environments. The design of the Greenways Program has successfully integrated multiple uses and functions of riparian areas. It provides people with access to a variety of natural settings with many user groups visiting the network of stream corridors for pedestrian and bicycle transportation, as well as both active and passive recreation. Not only do people use these spaces for transportation and recreation, but the greenways also successfully address habitat protection, floodplain management, stormwater drainage, and water quality improvement. The Greenways Program draws on the city’s revenue from sales tax to support the Open Space and Mountain Parks departments. Although the sales tax revenue was not implemented solely for the Greenways Program, it is a unique initiative that benefits the program. The Greenways Program also receives funding from the City’s Transportation Fund, Stormwater and Flood Control Utility Fund, and the State’s Lottery Fund, for a total of $450,000 annually. Additional funding is also available through the Urban Drainage and Flood Control District and Federal Transportation funds. The Boulder, Colorado Greenways Program is continuously updated, building on itself and incorporating new knowledge and assessments. However, it has been reported that the linkages between some of the trails and trail networks are weak, and that crowding sometimes results in conflict from user groups. These are identified as areas for improvement of an otherwise successful program.